Any questions, comments or data acquisition stories,get in touch via email, Twitter or Google+. When collecting data from serial instruments, sometimes the readings don't appear like you think they should. 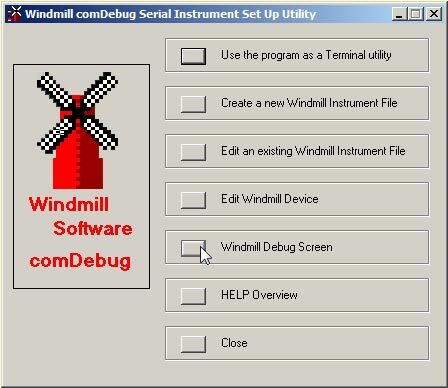 To help you identify the communication problem the Windmill ComDebug software (available free to subscribers) now has a "Debug Screen", which shows messages from the universal serial device driver, ComIML. The ComIML driver grabs readings from measurement instruments and sends them to the other software applications like Windmill Logger and Chart. ComIML also sends out information about exactly what messages receiving from the instruments and what it is doing with them. To see this information, open ComDebug and choose Windmill Debug Screen. When setting up your instrument you can specify a Timeout, so the the software doesn't get stuck waiting indefinitely for a reply from your device. The timeout begins at this Start of Parse Attempt. When ComIML extracts a value, it allocates it to a channel. So a data value from a balance would go, for example, to the weight channel. A temperature reading might go to the temperature channel. If you don't name a channel its number will be used. This line shows the channel name, its number and the data value that ComIML has extracted and sent to it. ComIML has successfully finished parsing the message. If the readings are not what you expect there might be a mistake in the parsing instructions which specify what data will be extracted. See https://www.windmill.co.uk/parse.html for help with parsing. This means that the instrument hasn't sent its message in time. It may be that the Timeout is too short - to change the Timeout, from ComDebug's Main Menu select Edit the Instrument Timings. The message sent by the instrument. ComIML can either query the instrument directly and extract data from its reply, or can extract data from a stored message. Which is does depends on your persistence time setting. If the persistence time has expired a new reading will be taken and Channel name, Number and Read will be shown. Channel name, Number and Persist means that ComIML has extracted data from a saved reading. Some instruments can become overloaded if instructions arrive too quickly. To prevent this you can tell ComIML to wait (in ComDebug). The end of the waiting is shown by the next action specified by the message. When a direct reading is being made, ComIML waits for either the reply from the instrument or timeout to elapse. In Background mode, ComIML does not wait for replies to be received. Instead it allows other messages to be implemented (on different COM ports). Whenever it returns to a Background reply it makes a fresh attempt to parse it. This means that you might see the early channels parsed several times before finally a complete parse is obtained. In Background mode the idle time delay is enforced between the end of one read of the module and the start of the next. This appears as a Wait message. Question: What is the meaning of Byte, Char, Hex? Please advise how to set up ComDebug? What is the meaning of Byte, Char, Hex? When using ComDebug to send messages to serial instruments, you can enter data either as ASCII characters (Char) or in hexadecimal format (Hex). Data is sent to the instrument one byte at a time. Each byte might represent one character - a letter, a number, a symbol or a special character like a return. The screen shown below shows the letter "S" followed by a carriage return (013) and linefeed (010) being sent as a command to a measuring instrument. Enter letters, numbers and symbols simply by typing into the Char column. For special characters like carriage return, linefeed and escape use the NonPrint menu. They are shown as their "character code". We've a table of characters codes, ASCII characters, control codes and hexadecimal values at https://www.windmill.co.uk/monitor183.html#ASCII which you may find helpful. When you type something into the char column, its equivalent hexadecimal value is shown. You could instead type directly into the hex column. This is mostly used when communicating with Modbus instruments. In future tyre sensors will read pressure, load and tread depth and alert drivers as to when tyres need changing, according to Continental. The quality of the data they can gather is driving the use of autonomous underwater vehicles (AUVs). Able to fly metres above the seabed - or close to subsea installations - AUVs enable operators to rapidly deploy a range of high-frequency sonar systems, cameras and sensors to gather detailed subsea data. Inexpensive wireless sensors which can identify species of insect with 99 percent accuracy are expected help fight insect-borne diseases like malaria and prevent crop damage. According to a report by MarketsandMarkets, the automotive sensor market expected to grow at a CAGR of 8.6% from 2014 to 2022. The demand for sensors is continuously growing in diverse automotive applications.